Delaware Christian’s Lyssi Snouffer (20) reaches for a rebound during the first half of Thursday’s non-league showdown against host Village Academy. 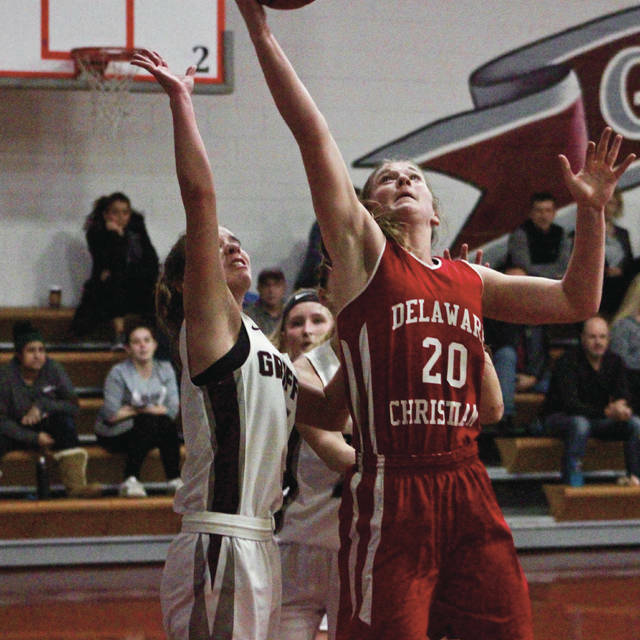 POWELL – Lyssi Snouffer added another milestone to her already storied athletic career at Delaware Christian. The junior three-sport athlete is now the school’s all-time leading scorer in girls basketball. She scored 31 points to lead the Eagles to a 64-28 win at Village Academy in non-league action Thursday night. Snouffer needed just three points coming into the game to break 2012-graduate Haley (Kirby) Copley’s mark of 1,240 points. “We’ve had so many phenomenal basketball players at our school and I just feel so honored,” Snouffer said. It took Snouffer just two possessions to get what she needed, scoring on a layup on the Eagles’ first time down the court before adding a free throw on the next to set the mark with 6:42 left in the opening frame. Snouffer’s free throw broke a 2-2 tie and started a 21-1 run that broke it open for the Eagles. Snouffer scored 15 points during the run, which ended on a Devan Fry 3-pointer with 5:22 left in the second quarter. Abbi Maurer was a key part of the run, assisting on six baskets in the first quarter alone. Erin Bauslaugh scored all eight of her points in the first half and Hannah Maurer added a pair of 3s to help the Eagles push the lead to 35-9 at the break. Abbi Maurer finished with nine points, 11 assists and seven rebounds and Hannah Maurer added six points, five boards and three assists for DC (17-4). Snouffer, who finished second in the state high jump last spring, surpassed 1,000 kills and 1,000 digs in volleyball in the fall. Her next milestone is already in sight. She pulled down 15 rebounds to bring her within nine of reaching 1,000 for her career. Reminder: she’s only a junior. Snouffer averaged 25.5 points, 20.1 rebounds, 3.5 steals and 2 blocks per game coming into Thursday’s action. She’s been battling an ankle injury, so Boggs has been keeping her off the opposition’s best player on defense. She decided to let her go against VA’s Maddie Majewski. Majewski is having quite a year in her own right – averaging 16.8 points, 12.2 rebounds, 5.3 steals, 5 assists and 3.2 blocks per game. She’s second on the team behind Rachel McLoughlin (19.5 points per game) in scoring and tied with McLoughlin in assists. McLoughlin scored eight of her team-high nine points in the second half and Majewski finished with 10 rebounds to go with five points and three assists to lead the Griffins (10-6). Guarding Majewski might have slowed Snouffer’s bid at the rebounding mark. The all-everything junior runs the Griffin offense. DCS concludes its regular season slate hosting Fredericktown in non-league play Saturday night at 6 p.m.
VA, meanwhile, travels to Tree of Life Saturday at 4 p.m.
Hannah Cowan poured in a game-best 18 points, Chelsea Edington added 10 and Anika Craft had nine to lead the Barons to a solid MOAC win over the visiting Tigers Thursday night in Delaware. Buckeye Valley had a slim 11-8 lead after the first quarter, but outscored Galion 11-3 in the second to break things open. The Olentangy Liberty wrestling team dominated Thursday’s dual against visiting Westerville Central, cruising to a 65-3 win on Senior Night. Kaden Tong, Brian Cox, Connor Brady, Chase Dormire, Jayce Fitzpatrick and Hunter Ford each picked up pins to pad the Patriots’ point total. Other winners included Carson Kharchla (22-7), Stephen Dirksmeier (8-5), Austin Bensman (14-4), Lucas Uliano (17-5), Adam Gintert (8-3) and Josh Sutton (15-7). The Pacers started strong, winning all but one of the first seven matches and 12 of the 14 total on the way to a lopsided OCC dual-meet win Thursday in Hilliard. Hayes winners included Tamas Eder (19-4), Thomas Ross (5-1), Zack Raquepaw (7-2), Zach Williams (5-4), Emmett Cain (21-5), Mason Sutandar (10-2) Corbin May (9-0), Jacob McCloskey (14-5) and Isaac Robinson, Tristan Burton, Nathan Robinson and Zachary Pokorny, who each pinned their respective opponents.